Holiday prep-time has begun. Over the weekend, my husband and I were in full-organizational mode at our apartment: getting rid of trash, boxing up books and items for storage, swapping winter clothes for summer clothes (next weekend’s chore), buying cleaning supplies, and buying Xmas/birthday gifts for my 4 nieces and nephews. So, my home is still in “transition”, and I’m scrimping pennies for lunch this week until payday. There might a few soup enteries. Fine by me! 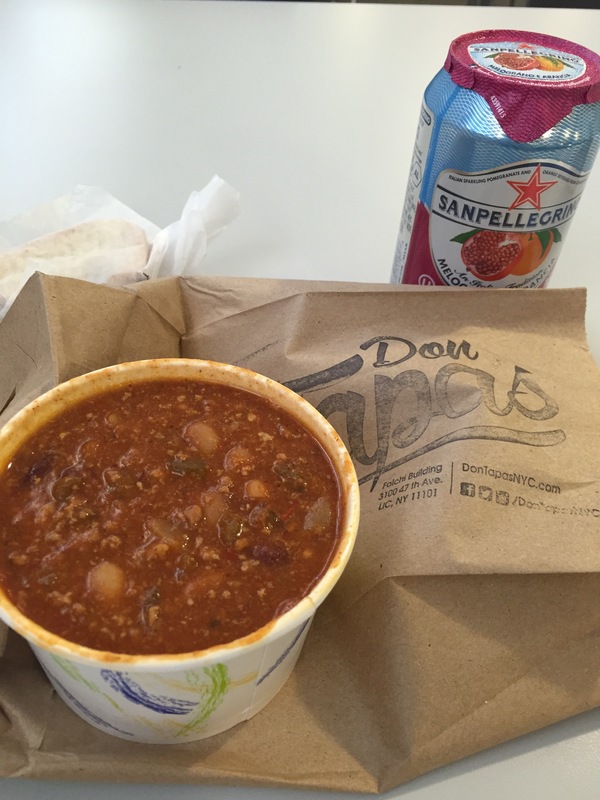 Today’s soup, courtesy of Don Tapas, is beef chili. This chili is hardy, full of beans, a rich tomato-based sauce with plenty of beefy goodness. This spice blend was mild, not too pungent, and accessible for most palates. I liked the fact that it was served plain, without cheese and/or sour cream. The toasted baguette piece accompanying it was unsubstantial; I rather prefer to get some of their crisp bread (it’s like a fancy chip). Along with SanPellegrino’s pomegranate and orange drink, the total price of my lunch was $5.99. Not bad at all.